This is a great week of cross country skiing dedicated to improving your 'skate' skiing. Skate skiing evolved in the 1980's as a separate discipline to the 'classic' style of cross country skiing. Instead of imitating a running motion on skis 'classic' style, 'skate' skiing echoes the same motion as ice skating. It is graceful, powerful and the perfect all-over body workout. The tracks in the Obergoms Valley are perfect for 'Improvers' with excellent terrain that is mostly flat or gently undulating. If you have tried 'skate' skiing and now want to improve then this trip is for you. Reliable conditions and up to 85 kms (54 miles) of ski trails offer something for everyone in this 'Swiss chocolate box' winter wonderland. The Obergoms valley is renowed for it's top class cross country skiing. The area is a mecca for cross country skiers from throughout the world who want to enjoy the Swiss Alps and explore 'La vallee de Conches' the valley of the church bells. Here you will join the dedicated 'skate' crew who come from all over the Alps to enjoy the trails in the Obergoms. With the help of the local train, included with your ski pass, we can explore new trails every day. The Obergoms is a beautiful open valley situated at the source of the Rhône river, where the language is Swiss German. This evening we meet you at your hotel in the ancient village of Oberwald to brief you on the days ahead and answer any questions. Day 2: Get your skates on! This morning we will collect your skis from the local hire shop, and we will then spend time on flat terrain doing some exercises to warm up our muscles without skis. Next step is skis on, and some simple drills to remind your body of the skating motion. Today is very much about doing various exercises and drills that will promote confidence and enjoyment on your skis. The aim of your Instructor is always to make sure you get the most out of your week whether that be small improvements, or major changes in your skiing over the five days. Our aim is to help you achieve any goals you have chosen to set yourself. On the other hand you can just enjoy the skiing, eat cake, drink coffee and visit the sauna - it's not a boot camp! Today we will aim to ski the peaceful and scenic river trails which offer an excellent and easy introduction to the valley. Each village has it's own picturesque landscape and maintains it's mountain traditions. The continually tracked and groomed ski pistes have many detours where we can lengthen or shorten our day. We will spend time this morning looking at 'skate 2' and teaching the movement pattern required. 'Skate 2' should be your main skate motion, and the foundation for the other skate patterns. As part of this week your Instructor will film your ski technique and offer advice and suggestions for any improvements. This is, of course, optional but film is one of the best ways to provide feedback and for you to understand how you skate. Often viewing your ski technique is the best way to 'get it', and understand your challenges and how to achieve your goals. After doing some exercises to consolidate yesterday's lesson we will make our way along the valley to the wonderful old village of Münster. Usually we stop for coffee along the way, and take time to enjoy the views and the photo opportunities. Once we reach Münster you can choose to either catch the train or ski back. If you choose the train you might like to know your train ticket is included in your ski pass, and you can just jump on whenever you feel you have had enough and head back for a sauna! The ski tracks wind along the entire Obergoms valley, and today we start by taking the local train to the village of Münster where we finished yesterday. From here we begin our ski journey down the valley towards Neiderwald. The villages in this valley are truly wonderful, made up of old traditional houses of dark brown or black weathered wood with a topping of snow, and red window shutters. The route takes us through woodland, over rivers, and past old settlements, and provides plenty of options for loops and variations on the route. A morning stop at Reckingen where the farmer and his wife serve excellent coffee and cake is a must. We then continue to Neiderwald where lunch is often in the wonderful old cafe of "Drei Tannen", again a feeling of having stepped back in time. Then it's back to letting the train take the strain as we return to Oberwald. If you choose you can then spend some time re-fining your technique on the tracks near your hotel. This means you can 'opt-out' at whatever point you feel is enough for the day. Today we will take a trip to the other side. In the winter months the road ends at Oberwald as the heavy snows make the famous Furka Pass impassable. However, the train keeps running and takes a route forged straight through the mountain under the Furka Pass via a tunnel which was opened in 1982. This morning we will take the train, and after about 25 minutes we will emerge in the next Swiss canton of Uri at the tiny community of Realp. We continue to the famous alpine town of Andermatt where we can enjoy skiing the local trails, and take lunch in the town which has a more Germanic influence that the 'other wise' in the Obergoms Valley. The trails beside the town are flat and wide and offer good skating. Our route back to Oberwald involves considerable climbing and it may be that we simply opt to take the train all the way back. Or if you are feeling strong we can ski part of the way back and then take the train. It means plenty of opportunity to address 'skate 3' our hill gear! Our final days skiing is back in the Obergoms valley where it's time to set your own challenge! The route known as the "Loipe Goms" runs a total of 26 km (16.3 miles) between Niederwald, at 1251m (4103ft), and Oberwald at 1368m (4487ft). We will set off from Oberwald heading for Niederwald letting gravity help our skating as we will be heading very gently downwards. En route we pass all the lovely old villages which line the valley with their ancient farms and barns where the farming traditions of the area are actively preserved. These wonderful old buildings are made of wood which has been weathered to a dark brown colour or in some cases black, with the passage of time. There is certainly plenty to look at as we make our way along by the river, and indeed plenty of cafes and restaurants to pause for a rest and a 'refuel'. If at any point you feel you want to have a more relaxded approach to this day you can simply hop on the train at one of the many stops. Today is departure day, most likely on the local train? Our hotel is in the tiny and characterful village of Oberwald which is nestled at the far end of the Obergoms Valley. The rooms are cosy, with en suite facilities. Breakfast is plentiful and with a varied selection of food. Dinner will usually be eaten at a nearby restaurant. There is a fitness room and spa, with saunas. The hotel is owned and run by Dirk, who is originally from Holland, and in our experience is very helpful. He will even collect you from the train station if you feel you need it. Oberwald is easily reached from other European and worldwide destinations by road, rail, coach or plane. Within Switzerland the trains are by the far the easiest and most efficient way to travel. Visitors can obtain a holiday/ visitors card from SBB which enables you reduced rate rail from/to airports to your holiday destination and throughout your stay in Switzerland. Times and prices vary depending on the length of your stay. For further details please refer to the Swiss Railway website. The closest airports are Sion & Bern (2.5hrs), then Zurich (3.5/4hrs), or Geneva is a little bit further away (4hrs) - all times are by train. By road the Obergoms is 2.5hrs from Chamonix, 1.5hrs from Martigny. To find out more about the region then please visit: Obergoms and Andermatt Gotthard Tourismus. For our ‘Skate skiing’ trips the description above applies for the main part, but with the emphasis on improving and fine tuning your ‘skate’ technique. You should already have a basic skate and knowledge of ‘skate 2’ for this trip, and be prepared to develop ‘skate 1’ for hill climbs. One of the wonderful things about the Obergoms Valley is the train line which runs along the valley with services throughout the day. Your ski pass includes free train travel making it very easy for you to opt out of any part of the day. If you are tired you just hop on the train! 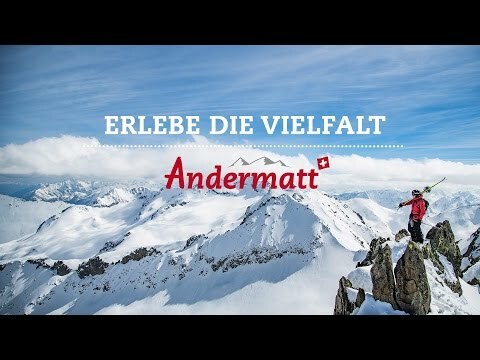 A window into the world of Andermatt. We will aim to visit this famous alpine town during your trip.